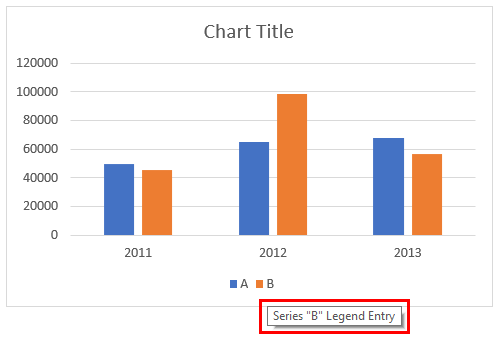 Legends in Chart | How To Add and Remove Legends In Excel Chart? How to Remove a Legend in Excel? 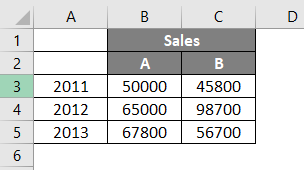 How to Add a Legend in Excel? How to Change the Position of Legend? How to Edit the Legend Text in Chart? Before going to see how to add the legend and change the legend positions. First, we will understand what legend is. 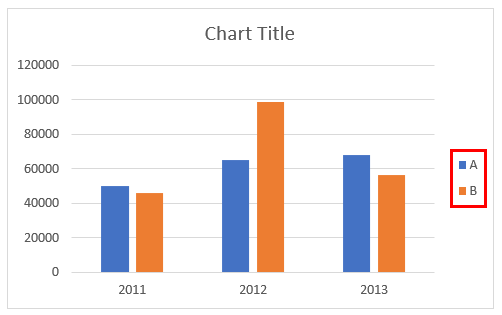 A Legend is a representation of legend keys or entries on the plotted area of chart or graph which are linked to the data table of the chart or graph. By default, it may show in the bottom or right side of the chart. 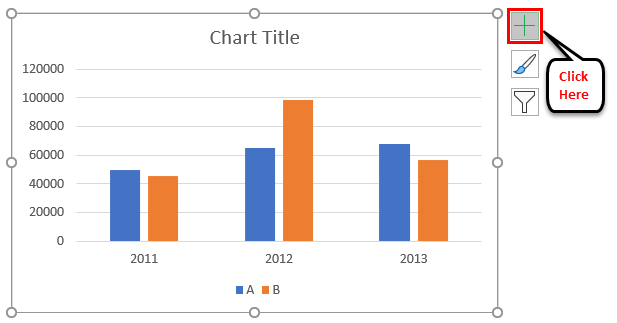 The data in a chart is organized with the combination of Series and Categories. 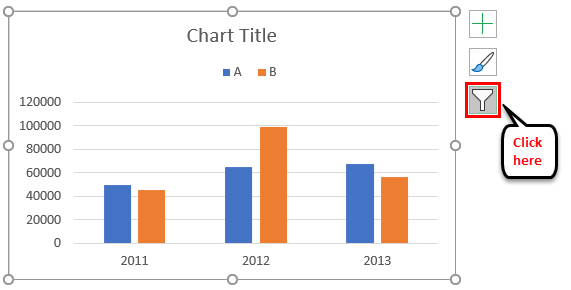 Select the chart and choose filter then will see the categories and series. Each legend key will represent a different color to differentiate from the other legend keys. Now we will create a small chart and perform different actions on legends. 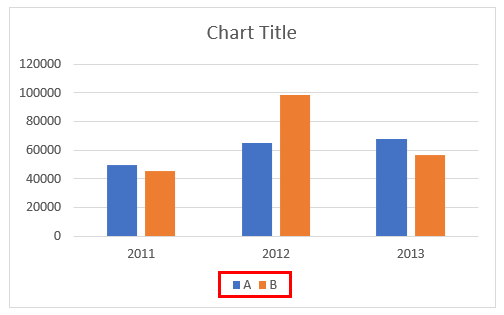 Consider a small table which represents the sales of A and B for the year 2011, 2012 and 2013. Now we will insert a chart by selecting the data and click on the Insert menu button at the top. After that select the Recommended charts option. The below-suggested chart box will open. 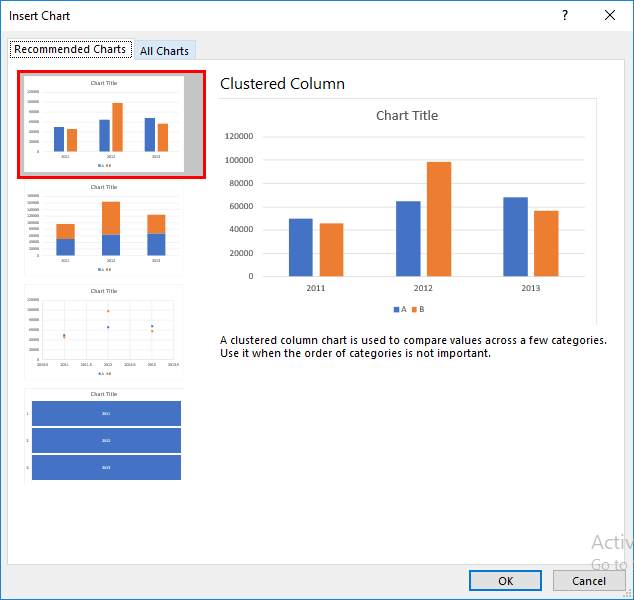 Choose any one chart from the available charts. Here we have selected the first chart. Then the chart will appear as below. In the below chart, the keys A and B are highlighted with a red color box which is called Legend. 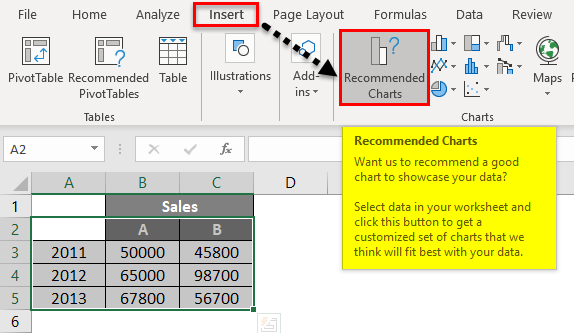 The Legend will be created automatically when we create a chart in excel. 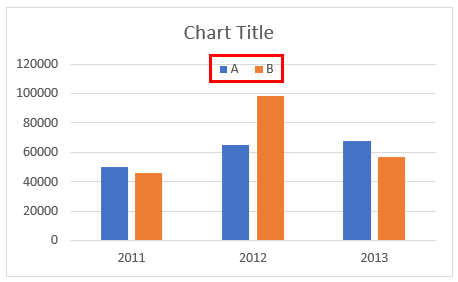 If we observe, A and B are representing two different colors and the bars are also representing the same color for 2011,2012 and 2013. Here legend keys are vertical series of data. If we place the cursor on the legend keys it will pop up the message. If we want to remove the legend from the chart. Follow the below steps. Click on the chart so that it will be highlighted as below. Click on the “+” symbol on the top right-hand side of the chart. It will give a popup menu with multiple options as below. 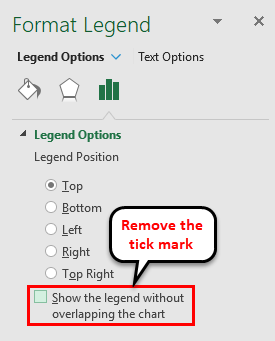 By default, Legend will be select with a tick mark. If we want to remove the Legend, remove the tick mark for Legend. Now we removed the tick mark hence the Legend is removed from the chart we can observe in the below picture. 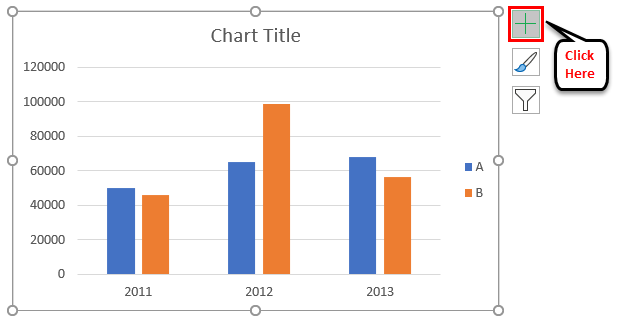 If we want to add the legend in excel chart it is a quite similar way how we remove the legend in the same way. 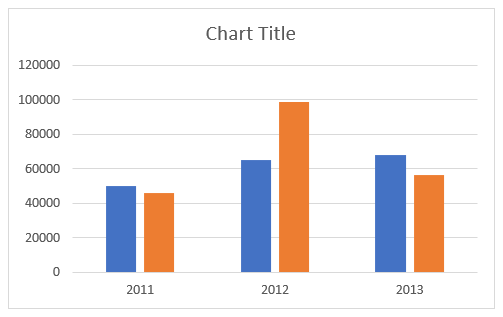 Select the chart and click on the “+” symbol at the top right corner. From the pop-up menu give tick mark to the Legend. Now Legend is available again. If we observe the legend is now available on the right-hand side before it was at the bottom of the chart. 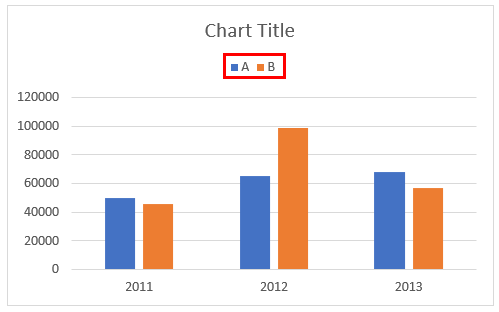 How to Change the Position of Legend in Chart? 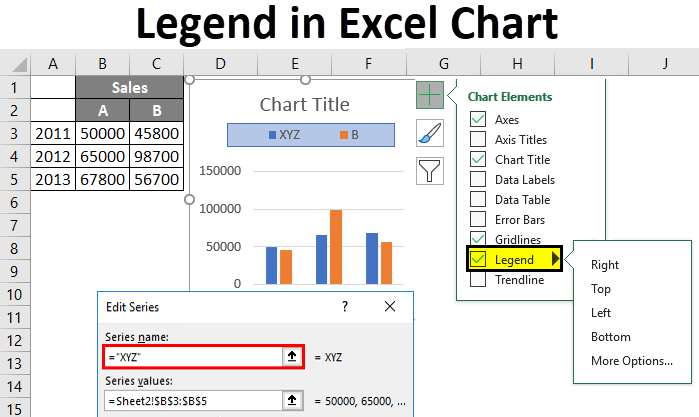 Now we will see how to keep the Legend in excel chart at the required location. Select the chart as usual. Click on the “+” symbol. From the pop-up menu if we observe there is arrow directing towards the right when you choose legend. Click on the right arrow. As our Legend is now on the right side hence when we open the “Right” option is highlighted. If we want to keep the legend on the Top select Top similarly as Right, Left, and Bottom. In this example, we will choose the Top option. Hence it moved to top as below. Up to now, the Legend always appears separately from the chart. If we want to overlap the legend on the chart then click on the More options available on the Legend. When we click on More options, on the right side format menu for legend will appear. At the bottom of the Format legend Show the legend without overlapping the chart option is available with a tick mark. If we want to remove the tick mark, click on it. Then the Legend will overlap with the chart as below image. In case if we want to replace A with XYZ and B with ABC but without changing the data in the table then, in that case, we can edit the Legend text. 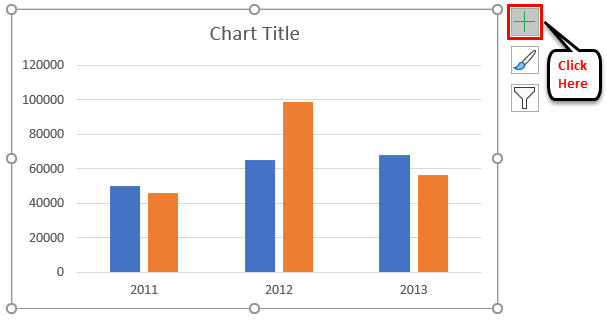 Select the chart and select the Filter on the right-hand side of the chart. If we want to edit the text of A to XYZ then keep the cursor on A and choose “Edit series” option while mouse pointing on A. Now click on Edit series. An Edit series dialog box will appear as below. It has a series name address and series value address. As we want to change the series name to XYZ, change the name to XYZ and then click on OK. 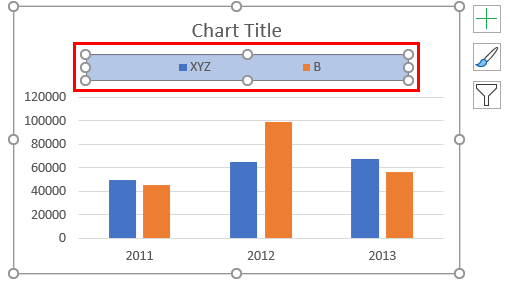 The column name remains the same as A but on the chart, it is changed as XYZ. If we want to give the border to the legend we can give by using “Format legend”. Under the border option select the Solid Line then it will create a border for the Legend. If we want to give the background to the Legend. Click on “Fill” drop down and select the option Solid Fill. We can give the required color by changing the color option which is marked in the above image. Instead of color, we can also select Gradient fill, Pattern fill, and picture. If we want to change the space occupied by the Legend select the Legend and drag the legend using the mouse as per required size. 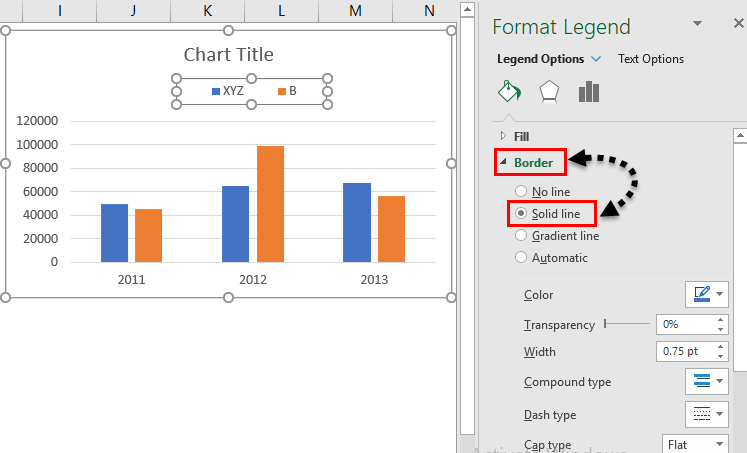 Legend is the space located on the plotted area of the chart in excel. It has Legend keys which are connected to the data source. 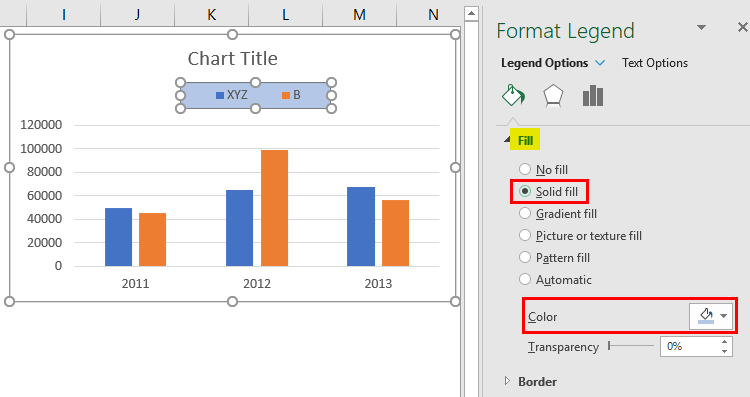 Legend will appear automatically when we insert a chart in the excel. 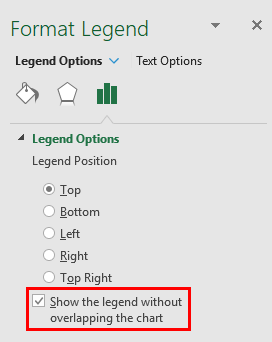 We can move the Legend to top, bottom, right and left of the chart as per requirements by clicking on the “+” symbol and select the Legend option drop down and choose a required option from the drop-down. Legend key names can be edited by clicking on the filter option and change the series name. If we want to remove the Legend from the chart we can remove by disabling the legend option from the “+” sign or select the Legend and click on delete.